We admit it. We have a soft spot for our friends. Today’s giveaway is from Wanderluster Design, a newly-launched brand of travel-inspired statement jewelry conceived and designed by Rammy Lee Park, aka our very own Miss Ariadne Ax. When not making films or reporting for hostessing duties here, Miss Ariadne tries to sate her wanderlust by getting out of New York and into the world, with recent travels to Ireland, Turkey, China and Korea. She wanted to turn those experiences into elegant pieces of wearable art, with the hope of evoking the memory of the place through the design. Her first collection, AMARGOSA, is inspired by her recent trip to Death Valley, California. In her words, she designs with the kind of woman she admires in mind: adventurous, risktaking, intelligent - with a lust for life, art, travel and wonderment. Sounds like you, doesn’t it? Us too. Lucky for us, Wanderluster is giving away a pair of LIVE-FOREVER earrings, inspired by the desert flora of Death Valley. 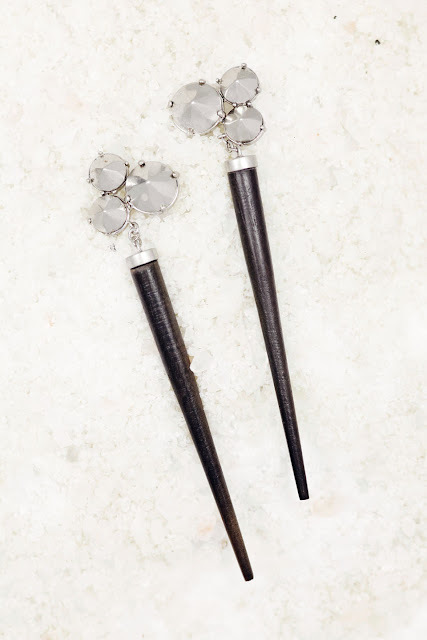 A hand-carved rosewood spike hangs from a triple spike stud. You know you want them. The Gastronomistas were lucky enough to get some prototypes early on, so trust us when we say these earrings turn heads. And we’ve done our best to make it easy for you to get a pair for free. 1 pair of LIVE-FOREVER earrings by WANDERLUSTER DESIGN. 1. Leave a comment on the post answering: If you had a free trip anywhere in the world, where would you go? INSIDER TIP: If you want more Wanderluster, they’re offering a promo on their Facebook page for 10% off until December 19th. Go get friendly. The contest closes in exactly 48 hours (10 am EST). Winner will be selected on Thursday, December 15th, and will be emailed that day. Good luck, and many thanks WANDERLUSTER! death valley is one of the most beautiful, enchanting places... i could always go there again! and wear these earrings! i would go to the land of the falling lakes in croatia. even the jungle could handle these fierce beauties! I would/will go to Tasmania!!! White water rafting in Papua New Guinea! I wouold be on my way to Antarctica in a heartbeat! I would go to Bora Bora and would wear these earrings the entire time! I would travel via the Hubble Telescope to the Trifid Nebula. If I were confined only to Earth, I would choose Angkor, Cambodia, to see Angkor Wat. I think they would look good on my girlfriend, on a trip to Shanghai.